Since long, Mexican haciendas have been linked to the ideas of affluence and sophistication. They are truly the most remarkable and visible remains of the wealth and architectonic richness of the colonial period. Fortunately, in the last 20 years or so interest in these haciendas in Mexico has revived. A good number of them has been partially restored and is being re-used as a restaurant or hotel..
Like the paradores in Spain or the pousadas in Portugal, which were in the past castles, palaces, monasteries, and other types of buildings of yesteryear. you'll find luxury and the finest accommodations within a setting of natural beauty. He bought and then sold San Jose, Santa Rosa, Temozon, Puerto Campeche and Uayamon to Starwood Hotels, whose main goal was to remodel these five into hotels for their Starwood Luxury Collection without taking away the charm and history. Yucatan hacienda hotels like Santa Rosa de Lima are known for their remote access, catering to those who truly want to get away from it all and have the means to do so. They are the perfect honeymoon setting or romantic get-a-way for the couple who has been everywhere and seen everything. Due to the elite status of the hotels, they are sought after by those who want to be by themselves, away from the typical hotel and beach scene. Getting back to nature and enjoying your stay in a hotel with so much history is part of the thrill of being there. Imagine what noble presences were once housed here! The rich history of the people who lived and worked in these buildings is part of the pull. 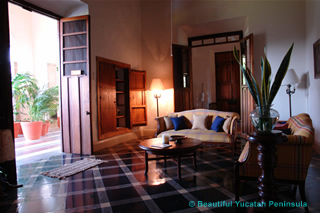 The Hacienda Hotel and Spa at Chichen Itza is one private-owned example. It's owners are very eco-minded, thus the property is being protected agains illegal wood-cutting of gum trees and they grow most of their own produce. Halfway the 17th century Mexican haciendas evolved as a continuity of a the European feudal system. Critical in their formation was the fact that the 'encomenderos' or the persons who held large pieces of land 'in trust' for the Spanish crown now became absolute owners of the land. And not only the land but everyone and everything on it, too. Thus, the mexican hacienda became a kind of micro-society where people often were kept in eternal debt and had to work all their lives under the absolute despotism of the hacendado. Needles to say some hacendados became very wealthy indeed. The typical mexican hacienda was a village on its' own. The owner lived in the casa principal, a manor house with heigh ceilings and imported furniture from Europe (they were fond of anything French at the time). There were other buildings with living quarters for servants, kitchen, warehouses for storeage, a chapel or small church, prison cells for punished workers (!) and a factory. In the Yucatan the workers and their families lived in thatched houses on the premisses. Depending on the region and natural resources there were different types of mexican haciendas, like the ones used for cattle raising or mining in central Mexico. Others were sources of produce or various other products that were exported. On the Yucatan Peninsula haciendas were the backbone of the colonial economy. The only three towns being Merida, Campeche and Valladolid, all activity during the colony was concentrated in the Northwestern part of the peninsula. 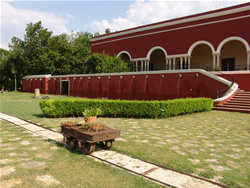 Thus, the yucatan hacienda was used for farming and production of henequen, a type of agave (not a cactus!). 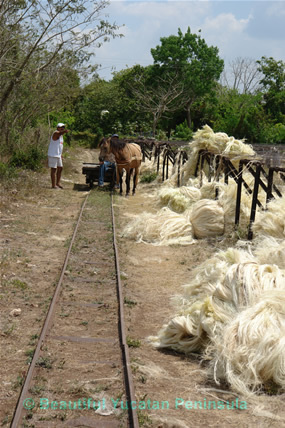 The fibers of this henequen plant were manufactured into rope. The production was started through the John Deere Company, looking for an alternative to the metal wire used for baling hay. Gradually all the cattle was replaced by henequen, which by the second half of the 19th century was a booming business. In the haydays of production henequen was known as "the green gold". An appropriate term if you consider that at the turn of the century the city of Merida counted more millionaires than all of Latin America together! This also explains the many elegant mansions along Merida's Paseo de Montejo. Green gold turned into bank accounts and inmortality. Compared to the lifestyle of plantations in the southern United States, the social class they represented in Yucatan was quite similar. The landowners were the masters, the Mayans were the servants of the hacienda. In practice they were slaves because mexican haciendas made their own coins to pay the workers. These coins were only valid on the property itself, so the workers had nowhere to go. Hacienda lodgings are nice, to say the least. However they have been completely redone. Fortunately though, a few remain that have not been remodeled into luxury hotels and still show off the glory of their decay. My favorite is Yaxcopoil. 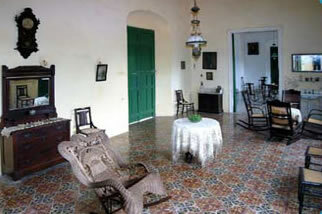 Dating back to the 17th century, this hacienda was one of the highest on the list when it came to importance. Instead of renovating Yaxcopoil, the owners chose to respect the buildings in their decay and turn them into a charming museum, easily accessible from Merida. You will feel like you've entered a movie decor, strolling through the heigh-ceiling rooms with tiled floors and the original furniture from the 1860's. Life was good, up top!